Name of the Trip : "Roopkund – Homkund Trek "
Besides its rivers, rivulets and streams, Garhwal is famous for its high altitude lakes, which hold up a mirror to the awesome peaks that surround them. Not one of the most beautiful, but certainly the most fascinating lake in Garhwal Himalayas is "Roopkund", the mystery lake. At an altitude of 4777 meters, this glacial lake is about 50 meters in diameter. It is so named, because of its banks lies the remains of human skeleton of scores of men who perished many centuries ago. Many mythological accounts and stories are heard about the remains, they range from Tibetan traders to refugees to Tughlaks army, who were on a mission to Tibet, under General Zorawar Singh. 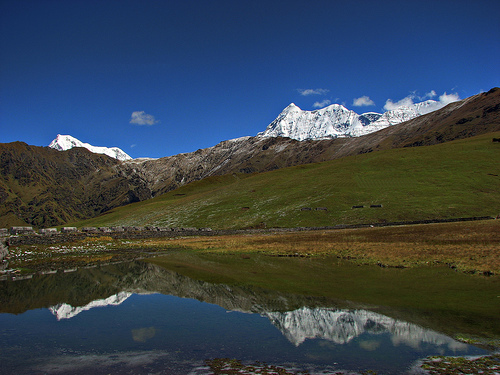 Homekund is yet another lake, situated at a distance of 8 kms beyond Roopkund. Homkund is the final destination of Nanda Jat Yatra, commences after every 12 years. 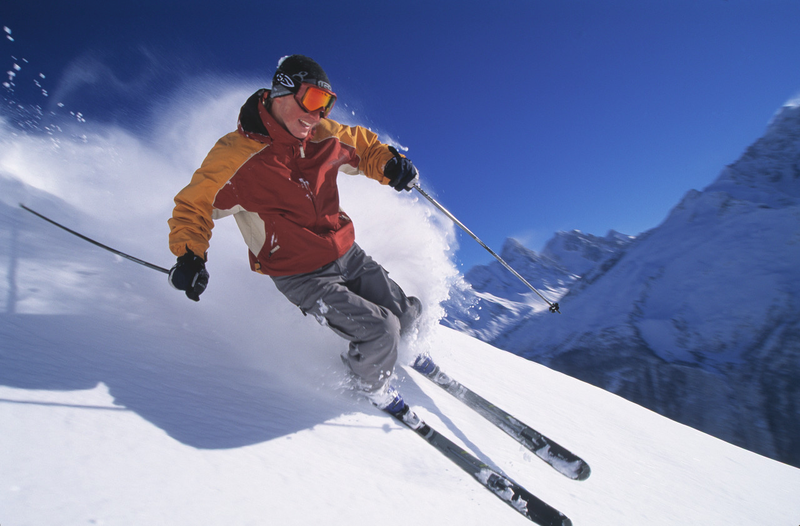 Along the route, one can witness the excellent close views of Nanda Ghunti (6309 meters), Trishul (7142 metres), Chaukhamba (7138 meters) and other important peaks. 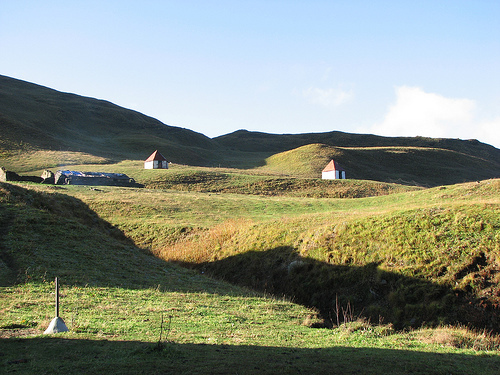 Apart from lakes and peaks, the trek passes through one of the best 'Bugyals' the alpine meadow of the area, i.e. Bedni have long been related to myths and mysteries. Even today, the local people witness the presence of fairies. According to a popular belief the Vedas were written in sylvan haunts of Bedni. Regularly visited and worshipped temple of Goddess Nanda Devi is situated amidst the meadow. Day 00.Arrive Rishikesh. Check in to High Bank Peasants Cottage. Evening introduction with trekking guide & camp staff followed by welcome dinner. Overnight High Bank Peasants Cottage. Morning after breakfast drive to Joshimath. The entire drive toady is along the Ganga and Alaknanda river. We stop at Devprayag to visit the confluence at the beginning of the Ganges. Arrive Joshimath and transfer to hotel. Evening visit the small hill town. Dinner and overnight hote. DAY 02. JOSHIMATH/ AULI/TALI TREK 5-6 HRS. OVERNIGHT TENTS .
. DAY 03. TALI /DHAKWANI TREK 5-6 HRS. OVERNIGHT TENTS. 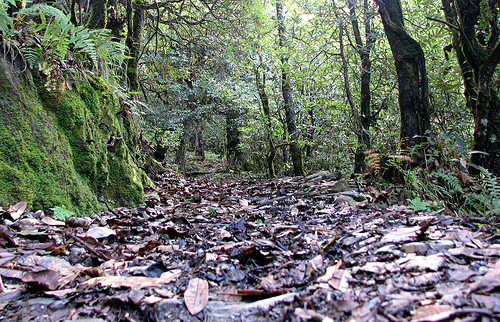 Trek in rich forest of OaK , rhododendron with steep climbing and steep descending till we reach Pana. Dinner & overnight camp. A 2 hour descending and 2 and ½ hour or 3 hour steep climbing in the forest of Deodar blue pines. (4-5 hours). Dinner & overnight camp. First 1 and ½ hour climbing in the forest there are some small patches of meadow on the way. 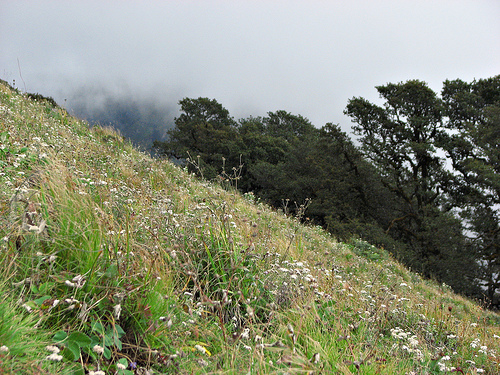 Chechani vinayak (pass) view of Trishuli, around 2 hour gradual descending in the meadow . Dinner & overnight camp. 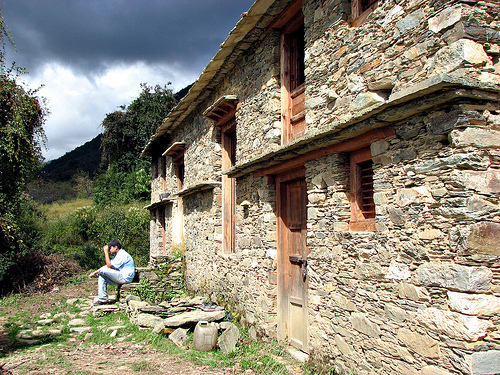 Easy but long walking In between 5-6 valleys, sutol last village in the confluence Nandakini – Roopkini . Dinner & overnight camp. 1 hour steep climbing 1 hour descending walking with the stream 2 hour steep climbing in the forest of blue pine , Oak , rhododendron and burch (5-6 hours). Dinner & overnight camp. 1 and ½ hour steep climbing the forest, ½ hour in the rocky path of the medow 1 hour flat walking in medow along the river roopkini , around 2 hour steep climbing to Bhagubasa . 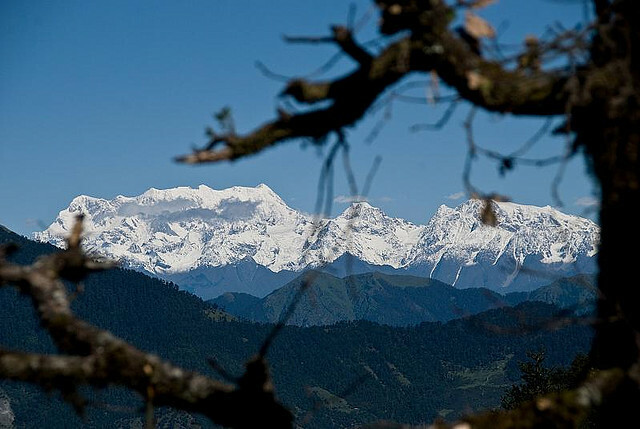 On the way view of Nanda Ghunti and trishuli, Chaukhamba , Neelkanth . Dinner & overnight camp. 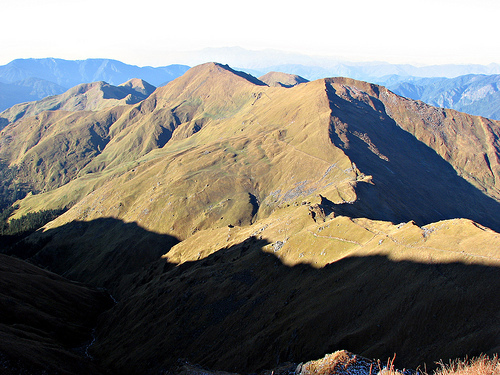 Patar Nachawani- Bhagubasa to Roopkund is easy walking in the flat but in moraines � hour climbing with same view as last day. (4-5 hours). 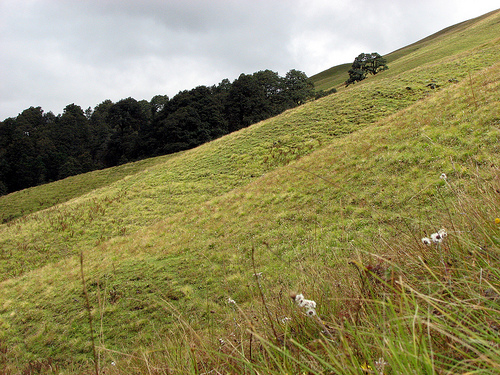 Kaluka Vinayak (pass) descending till to patarnachani. Dinner & overnight camp. 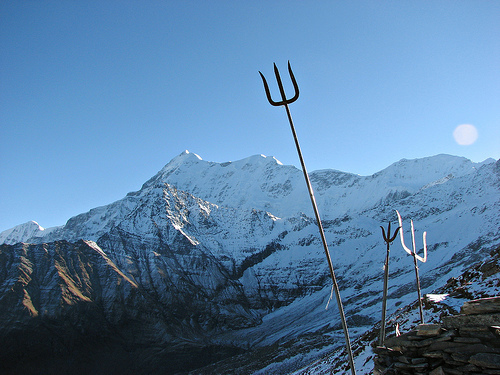 The best view of Chaukhamba , Neelkanth and Nanda devi , Trishul. 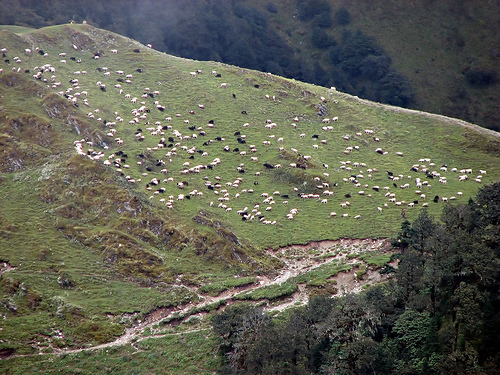 Whole trek is in meadow. (3-4 hour). Dinner & overnight camp. Steep descending 2 and � hour and 1 hour climbing in rich forest of rhododendron, Oak camping in small meadow of wan with the view of trishuli (3-4 hours). Dinner & overnight camp. DAY 13. WAN / LOHAJANG PASS/MUNDOLI TREK 4-5 HRS. Easy walking gradual descending around 3 hour and 1 and � hour steep climbing to Lohajang pass whole day in rich forest of conifer rhododendron etc. view of Trishuli from lohajang pass. Arrive and camp . Dinner & overnight camp. DAY 14. MUNDOLI / ( Shivpuri 15kms up river from Rishikesh ) RISHIKESH DRIVE 9-10 HRS. Morning after breakfast drive to Shivpuri . Check in to HIGH BANK Himalayan Retreat On the Ganges. Rejuvenate yourself with a complimentary Ayurvedic (Traditional Indian ) Massage. Camp fire BBQ followed by dinner. Overnight at the retreat. DAY 15 . RISHIKESH / Onward Journey . Morning after breakfast Trip terminates. On can stay in Rishikesh or drive to Delhi .